The headline means ‘The punishment’, and it summarises the outcome of the local vote pretty well. According to data from the French Interior Ministry, the centre-right (that is, the opposition UMP and its allies) gained 139 towns with more than 10,000 inhabitants compared to the 2008 local elections. 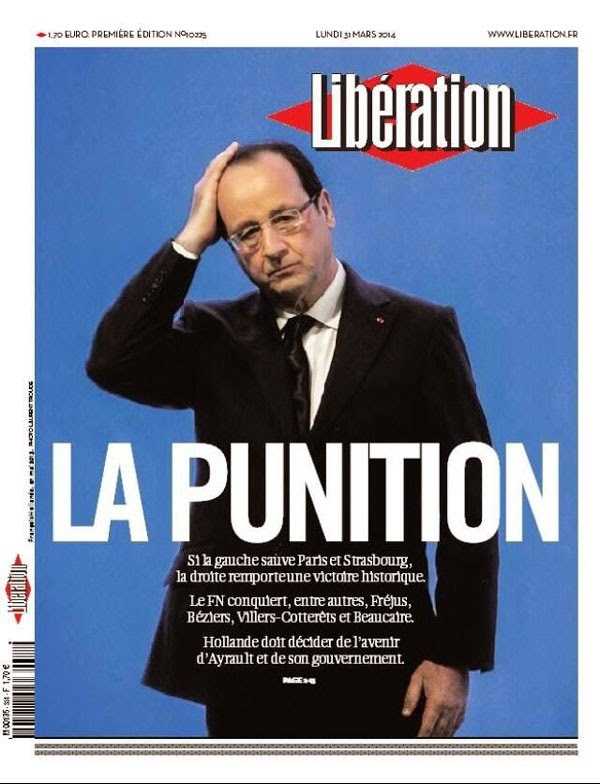 The centre-left (Hollande’s Socialist Party and its allies) lost 160. The fact that the Socialist Party managed to retain Paris – where Anne Hidalgo was elected as the city’s first female mayor – cannot compensate for what was an unequivocal defeat nationwide. Marine Le Pen’s anti-EU Front National took control of eleven towns – in addition to Hénin-Beaumont, where the party won an outright victory in the first round. Though not impressive in absolute terms (see this blog post from last week for some more background information), the score is nonetheless politically significant. It shows how French voters increasingly see Front National not just as a mere ‘protest party’, but as a credible alternative for power – albeit so far only at the local level and in a very limited number of towns. Meanwhile, the immediate consequence of yesterday’s local election fiasco is that Hollande is expected to announce a cabinet reshuffle any moment. The French President has just come out of a two-hour meeting with Prime Minister Jean-Marc Ayrault, whose departure looks very likely, judging by the headlines in the French press over the past few days. However, in light of the latest macroeconomic indicators, the impression remains that moving a few ministers around will not be enough to restore the French government’s credibility vis-à-vis the electorate – unless the policies also change and France makes some real progress in pushing ahead with the reforms needed to restore its competitiveness within the eurozone.